That's all from us for now, please join us later for coverage of tonight's Scottish Premiership matches. Celtic manager Neil Lennon: "You can always look for flaws, you can always look for things to improve on. You’re never going to get the perfect team otherwise there would be no point in turning up. "But what I like about this team is their mentality. Their mentality is excellent and their quality of football has been exemplary. "They’ve been exceptional for the club over the last two-and-a-half years and I just want them to carry on in the same vein." Celtic assistant manager John Kennedy: "When Brendan was leaving, he asked me to be prepared to take the team and see where it went from there. "It quickly evolved to the situation I’m sitting in now where Neil has asked me to be his assistant manager and I’m delighted just to do that. "We're in a crucial moment – timing wise it was difficult for people to understand and get their heads around. But behind that, there’s a lot of stability in the club. "That’s why Neil will come in and do a terrific job because of the support he will have behind him". Marshall:Welcome back and good luck to Neil Lennon. He's come back for 10IAR and the chance of a treble treble. Brendan Rodgers is away to win nothing with no European football. Paul: Neil Lennon very impressive in his press conference. Just what we needed today. Celtic manager Neil Lennon: "I’ve been on good behaviour this year. I’ve had no issues with referees or linesmen, to the point that I was voted on to the committee. "Earlier in my career I wanted to take on the world – with a big chip on my shoulder. It’s not a chip now, but I still have something on my shoulder. I like to have that edge. "But in terms of my behaviour, I will monitor that as best as I can. It’s maturity, it’s experience. Obviously, you don’t want to be here now and sit in the stand and not be able to do your job properly – so I’m very aware of that." During today's media conference, Celtic assistant manager John Kennedy revealed midfielder Callum McGregor has a calf injury and is likely to miss the next couple of games. That may put his participation in Scotland's matches next month against Kazakhstan and San Marino in doubt. You can follow live text and radio coverage of Neil Lennon's first match since returning to Celtic - away to Hearts this evening. There will also be updates from Aberdeen v Hearts, Kilmarnock v Motherwell, Rangers v Dundee and St Johnstone v Hibernian. "It's been a whirlwind 24, 36 hours" - Neil Lennon on his dramatic return to Celtic as manager. Celtic manager Neil Lennon: "[Compared to the manager who walked in in 2010] I’m not as volatile. I wanted to take on the world when I first took over. You learn from that, you mellow from that. "But I still have that energy. Tactically you learn the game as you go along. I don’t have all the answers, and certainly I don’t want to be compared to Brendan. "I know some people will do that as we go along. But Brendan has his way and it has been fantastic, and I have my way". Neil Lennon admitted he was "surprised" by Brendan Rodgers' departure from Celtic to join Leicester City because of "the timing" but can understand it from a professional point of view. "He's going to a very good club," said Lennon. Celtic assistant manager John Kennedy was asked about whether he had the chance to go with Brendan Rodgers to Leicester City but played down such a suggestion. "I've had a very good time here at Celtic," said Kennedy. "Since I finished playing I've been given different opportunities. I've been here my whole career. This club does mean a lot to me." Neil Lennon on Saturday's Scottish Cup quarter-final against Hibernian: "It's come very, very early. "I didn't expect to be going back to Easter Road after just a month away but football has these little coincidences, little quirks. "I'm not even looking at Easter Road at the minute. My only focus now is on tonight." Celtic manager Neil Lennon: "I'm looking forward to meeting the players and seeing them play. "Brendan Rodgers raised the bar, certainly in terms of trophies. Everybody's talking about 10 [titles in a row], I just want to get to eight. "Tonight we've got a really tough game against Hearts. I know it's an old cliche but we'll just take it game by game. "I just want to adjust quickly." Neil Lennon says there will not be much difference in style from Brendan Rodgers' time in charge, commenting: "It'll be expansive and easy on the eye and hopefully some winning football." And he said of assistant John Kennedy: John is imperative to me. I'm delighted he's joining me in this." Kennedy responded by saying he was "delighted to be part of this". 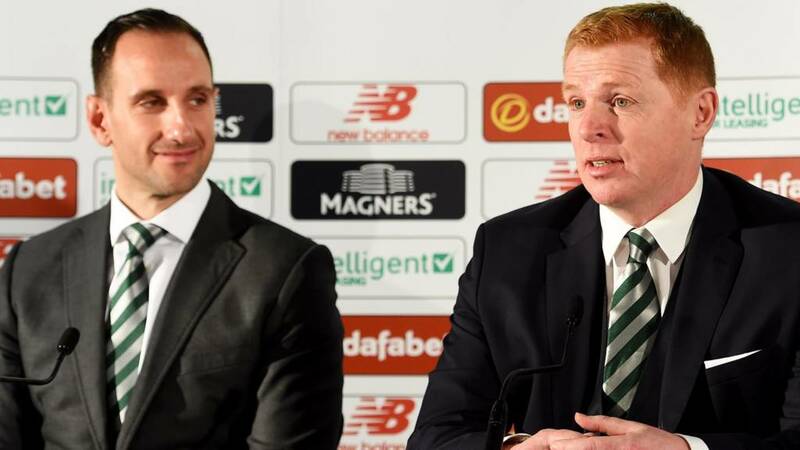 "I'm not even thinking about that," said Neil Lennon after being asked if he wanted to keep the Celtic job beyond the end of the season, insisting that it was up to the club. Neil Lennon is unsure whether he will be in the dugout for tonight's match against Hearts at Tynecastle and thanked assistant John Kennedy for preparing the team. Neil Lennon apologised for his late arrival then said of his return to Celtic it was a "no brainer". "Very very grateful to be here," he said. "The board, Peter [Lawwell] and Mr Desmond have put the faith in me to see out the season. "The most important thing is the club. We've lost a manager who will go down as one of the greats. "I've got big shoes to fill. I'm looking forward to the challenge."